● Introducing Customized Orthotics that are affordable. ● Computerized X-Rays. In house at Pleasant Hill Chiropractic. fracture. Most practitioners will do only two views. X-Rays are only suggested when warranted and not standard protocol for every new patient. The cost for X-Rays are kept affordable $55 per series (A series means radiographs of a specific area) depending if you need your X-Rays burned to a CD. In sharp contrast to "Cold Lasers" (LLLT or Low Level Light Therapy) which provides no feeling or sensation, patients FEEL each Aspen Laser treatment, as it works to provide laser light energy deep into the body to reach damaged cells and tissues. Results are typicallt faster than many other therapeutic modalities and patients often report signs of improvement after the first or second treatment. Both acute and chronic injuries respond well to the Aspen Laser treatment. Inflammation and swelling are quickly reduced to allow a greater range of motion in the affected area. This helps to regain activity and mobility while reducing scar tissue and adhesions which can slow recovery and healing. Sick and injured tissues are restored to optimal strength and vitality, providing greater functionality and preventing re-injury. According to Dr. David Greene MD, spinal decompression treatment was FDA cleared back in 1996. Over the past 15 years its popularity has been rising as it represents an excellent alternative to surgery. The cost of spinal decompression is less than 5% of the cost of surgery, and the risk profile is very low. The popularity for spinal decompression initially was for low back pain, however, as the years have gone by it's been showing considerably good results for neck pain. The science behind spinal decompression works the same for both cervical and lumbar. Spinal decompression involves intermittent traction with an attachment on the machine which pulls underneath the mastoid process on each side of the neck. It's very comfortable and gentle - a lot of patients fall asleep on the table. The intermittent nature of the traction prevents the neck paraspinal muscles from going into spasm. As the traction works, it creates a negative pressure within the disc itself. This allows for an increased blood flow into the disc, bringing with it increased oxygen and nutrients. This can help dramatically with degenerative disc disease along with herniated discs. It may allow the disc pressure to be alleviated off of the nerve root being compressed, and the pinched nerve may no longer be pinched. In addition, the intermittent traction may allow relief from spinal stenosis, which is where multiple nerve roots are compressed from arthritis and bony/soft tissue overgrowth. This relief may last for quite a few months. Treatment sessions last between 20 and 60 minutes. Patients often fall asleep during treatment, but it doesn't mean it's not working. 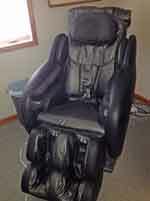 For the lumbar region, research shows that it works well over 75% of the time. A typical length of therapy lasts for 20 sessions over a period of 6 to seven weeks. The risk of an adverse event from spinal decompression is very very low. It is non surgical, non interventional, and non forceful. Pain management treatment will depend on the patient's symptoms, signs, and what the imaging studies show. It may include epidural injections, facet blocks, possibly subsequent radiofrequency ablation. Along with spinal decompression therapy, patients have a very good chance of avoiding surgery while being able to return to work, socializing, and doing things like playing with kids and pets. Spinal decompression therapy is otherwise called Vertebral Axial Decompression. In the early days, major surgeries were the only relief for chronic lower back pain. Now we can avoid surgeries by making use of spinal decompression therapy. This therapy has an FDA approval for lower back ailments. This treatment is adopted for treatment of conditions such as pain in the lower back, buttocks, and hip with or without numbness in the foot or leg. to herniated disc for more than four weeks. Those having recurring back pain even after back surgery, which is more than six months old, can also make use of spinal decompression therapy. According to LiveStrong, benefits of the Use of Ultrasound in Physical Therapy are as follows; Ultrasound, according to Alain-Yvan Belanger, is the most commonly used modality in physical therapy today. Its use dates all the way back to the 1880s. Ultrasound machines generate sound waves that are higher than the frequency we can hear. The effect of these sound waves on the body’s tissues produces a number of benefits. the targeted tissues to rise. This is a benefit of ultrasound over a traditional hot pack, which cannot penetrate into deeper musculature or joint tissues. Ultrasound heads are available in a variety of frequencies that can target a variety of depths, which gives a skilled therapist the ability to send heat exactly where she wants it to go. Some conditions that may benefit from this deeper heat, according to Belanger, include osteoarthritis and phantom limb pain. that ultrasound therapy has the added benefit of increasing range of motion. Ultrasound’s deep heat is thought to have a healing effect on deep tissues. According to Belanger, ultrasound actually affects the metabolism of soft tissue cells. In addition, these cells often become more receptive to healing fluids, which are present in the increased blood flow generated by ultrasound. Because of this, Belanger goes on to report that ultrasound’s healing benefits may be useful in treating surgical wounds and soft tissue lesions. Another benefit of ultrasound is its acoustic effect. The waves generated by ultrasound cause tiny vibrations in the cells of the soft tissues. These microvibrations, as Belanger describes them, have an effect on the fibers that form scar tissue. Over time, ultrasound used in this method can actually prevent some scar tissue from forming, and may be able to break some scar tissue down. Examples of success in scar tissue management are episiotomy scars as well as Dupuytren’s contracture, which is caused by excessive scarring in the tissues of the palm. As with its thermal effects, ultrasound used to break up scar tissue can also maintain and increase range of motion. Some of the pain control from ultrasound comes from the mechanical results of the treatment itself. These include the decreased muscle spasms and muscle tightness as well as tissue healing. However, an added benefit of ultrasound comes not from what it does, but what it can help a physical therapist do. Combining the heating and healing powers of ultrasound prepares muscles for other therapeutic treatments that reduce pain, including stretching and strengthening. Relieve Pain-Electrical muscle stimulation (EMS) releases endorphins, which can help an athlete relieve pain associated with playing sports. If an athlete has had previous surgeries due to sports injuries, he or she will find his or her pain levels decrease after using electrical muscle stimulation. The stimulation also relieves pain because it increases oxygenated blood flow throughout the body, which can help him or her reduce swelling and inflammation. If an athlete does not want to start taking pain medications, which can cause him or her to become addicted, then electrical muscle stimulation is a great alternative treatment option. The contractions that occur during electrical muscle stimulation can strengthen the injured muscles, which will help injured muscles recover quicker. When a patient/athlete becomes injured, the muscles start to atrophy, and electrical muscle stimulation provides muscle re-education. Muscle re-education is a gradual process that a patient/athlete has to go through before going back to normal physical activity, and this re-education can enhance rehabilitation efforts without the pain of grueling physical therapy. has approved electrical muscle stimulation for this use. A patient/athlete that uses electrical muscle stimulation will have less stress and anxiety, which can help him or her perform better on the field. The contractions can help an athlete feel more relaxed, since more oxygenated blood is flowing through his or her body, and this can help him or her concentrate better. A patient/athlete that has lower stress levels will also be able to prevent injuries during athletic activity easier, since he or she will be focused on the task at hand, and not be worrying about everything. A patient/athlete that finds a way to relieve stress is also more likely to live a healthier overall lifestyle, not become involved in risky behaviors, and will feel prouder of his or her accomplishments. Muscle atrophy is a symptom characterized by decrease in muscle mass and can occur as a result of numerous medical conditions. According to Clover, electrical muscle stimulation may also be used to slow or prevent the effects of muscle atrophy by keeping weakened muscles active. This use is also FDA-approved. Osteoarthritis is a painful and sometimes debilitating condition caused by the degradation of joint tissues. According to a clinical study published in the "Archives of Physical Medicine and Rehabilitation" in December of 2008, electrical muscle stimulation was found to be an effective component of physical therapy for elderly patients who developed hip osteoarthritis after total hip arthroplasty surgery. patient/athlete with arthritis or osteoarthritis could also benefit from electrical muscle stimulation. A patient with arthritis will notice an increase his or her flexibility, range of motion, and coordination. Electronic muscle stimulator units can help rehabilitate muscles that have been injured due to trauma, surgery or disease. The contractions caused by the EMS help to strengthen muscles of individuals who may not be able to participate in physical therapy. The roller table has many adjustments which can be done depending upon the patient's comfort. The height of the rollers can be increased or decreased for greater or lesser pressure. and oxygen to discs, ligaments and muscles thus enhancing balance, mobility and strength. It also helps in restoring the correct spinal curves and increases circulation of the cerebrospinal fluid. The intersegmental traction table helps in re-establishing the normal range of motion of the spine in a very gentle and effective manner. It also aids in reducing the muscle spasms thus providing relaxation to the muscles. • The intersegmental traction table can treat body of all sizes, shapes, and weights in an equal and effective manner including children. Vibration Plate Therapy (VPT) is based on theories of Neuromuscular Re-education which means exercises that can improve the communication between the body and the brain via the nervous system. 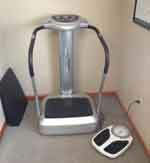 This works with vibration training as it relays on involuntary stretch reflexes which happen significantly as muscle quickly contract and relax during a course of therapy.As the plate vibrates your muscles are quickly contracting and relaxing another significant thing happens which is proprioceptive training (knowing where your body is in space) that helps improve balance. With specific exercises done over a ten to fifteen minute period a few times a week a patient can experience a proprioceptive and improved neuromuscular training effect usually within 6-8 sessions.Additional benefits of VPT conditions such as Peripheral Neuropathy, osteoporosis, scoliosis,arthritis, multiple sclerosis, Spinal Stenosis, stroke victims, Parkinson's Disease, back pain, obesity and more, to benefit from vibration therapy, vibration exercise and vibration training on the plate within their personal limitations. This may also allows the patient to go through physical therapy, rehab exercise and massage rehab with less pain…drug free. VPT can also energize, increase range of motion, rebuild healthy muscle tissue, increase circulation, reduce tension and stress.For the athlete VPT, mechanical vibrations are transmitted to the body through a vibration plate. As it stimulates fast twitch muscle fibers, there is dramatic increase to explosive strength, motor learning, muscular endurance and overall agility. All this results in more strength, more speed, more stamina, rapid recovery of muscles and tissue, increased flexibility, mobility and coordination. At a rate up to 2x faster than conventional training.For general health as we get older VPT provides the perfect tool that can help improve quality of life. VibePlate can help you become stronger and healthier without the need for a strenuous workout. Simply standing on the VibePlate increases flexibility and range of motion in a very short time. 15 minutes a day, 3 times a week on the VibePlate can help build strong muscle tissue, reduce strain on ligaments,tendons and joints, enhance blood circulation, tone your skin, help fight osteoporosis, increase range of motion and flexibility.VPT can be an intricate part of your wellness program at Pleasant Hill Chiropractic for improved physical and mental health to keep you energized and ready to play and live better! various internal dysfunction and disorders. According to traditional acupuncture theory, there are twelve energy channels called "meridians" running vertically along the length of the human body, each one linking to a specific organ. Illness is caused by obstructed energy flow at certain points along the meridians. Acupuncture therapy stimulates meridian flow and harmonizes the body's energy to influence the health of both body and mind. Researchers have begun to examine in Western medical terms the mechanisms by which acupuncture brings about physiological change. Studies have shown that acupuncture influences both the central and peripheral nervous systems. Further evidence indicates that acupuncture stimulates the release of brain chemicals such as endorphins, which function to relieve pain. Research also suggests that acupuncture increases immune system functioning, improves the circulatory system, decreases muscle tightness, and increases joint flexibility. Clinical trials lend credence to these results: acupuncture has been shown to bring about significant improvement for a variety of diseases. #1: Eases your aching back. May's issue of the Archives of Internal Medicine even found that people who were given "simulated acupuncture," where pressure was place on certain acupuncture points but no needles were actually used, saw as much as a 15 percent greater improvement in their symptoms (equal to the improvements seen in people who were receiving true acupuncture) than people who were taking medications and undergoing standard chiropractic care only. #2: Boosts the effectiveness of pharmaceuticals. .#3: Soothes the burning in your stomach. This June, Brazilian researchers published research finding that acupuncture therapy alleviated heartburn and indigestion in pregnant women. One group of pregnant women was given a combination of acupuncture and medications, and another group was counseled on dietary changes and given medications if needed. Over the course of the study, 75 percent of the women in the acupuncture group saw heartburn intensity, and antacid use, decline, while only 44 percent of women in the standard-treatment group saw those same effects. 4: Counteracts the effects of radiation. those effects can be, particularly for nausea and dry mouth, common in patients receiving radiation to the head and neck. A review of studies published in CA, a journal of the American Cancer Society, found that people undergoing radiation treatment perceived fewer negative side effects of radiation even though the side effects may still be there. For instance, in one study, patients who wore acupressure bands during treatment said they felt less nausea, although they still had the same occurrence of vomiting as they did before wearing the band, and in another study, people said they had less of a problem with dry mouth, even though measures of their saliva showed that levels remained the same. The acupuncture didn't actually alleviate the symptoms, but it did help improve patients' quality of life after treatment. A review of 22 studies involving acupuncture therapy, migraines, and tension headaches found that regular acupuncture therapy was effective at preventing tension headaches and migraines from becoming a problem, and that it was an effective treatment for existing headaches. Acupuncture along with Chiropractic adjustments with Dr.
Piva have been very successful in reducing headaches. The influence of acupuncture therapy on obesity isn't as well-documented as the other examples we've listed, but there's enough evidence to suggest that it could be an effective weight-loss treatment. Researchers from Korea analyzed 31 studies on a total of 3,013 people, and found that acupuncture therapy led to greater decreases in body weight than lifestyle changes or medications. However, they note in their findings, published February in the journal Obesity, that flaws in many of the studies made it difficult to see how effective acupuncture therapy would be on obesity in the long run. But for people willing to try it, adding a weekly acupuncture session to daily exercise and a smart diet could lead to healthy gains. Acupuncture is gaining recognition in Western hospitals because of its results particularly with mitigating digestive discomforts like nausea, diarrhea, Irritable Bowel Syndrome, constipation and bloating. Correctly executed, acupuncture even helps to stimulate the intestinal tract to push out toxins. Acupuncture seems to facilitate opening elimination pathways. As a compliment, applying a mild electrical current through the meridians also helps to clear the neural messaging routes. has stood the test of time and is steadily proving itself, I think it's worth trying as a possible boost for your colon-cleansing program. By the use of Digitally imaged x-rays Dr. Piva is able to show you immediately what is going on with your spine. This process allows you to take a copy of the disc with you at the time of the x-ray. the body's natural healing abilities through stroking, kneading and hitting the body with an understanding of the principles of human anatomy. emotion. Children and young animals require touching, stroking and rubbing to thrive and grow, and touch has been linked to stress-relief and relaxation in adults as well. When a soothing touch is applied to the skin, messages are sent to the brain to relax the body and release endorphins, the body's natural painkillers. Rubbing the muscles and tissues of the body also help to work out any stiffness or tension that is stored in the body to improve flexibility and movement.